1. Measure how high the attic stairs are above the rough frame (2x6). This will determine the height of Attic Tent needed. Attic ladder side rail made with a (1x4) need a 7inch height Attic Tent. Note: Attic Tent height installed. 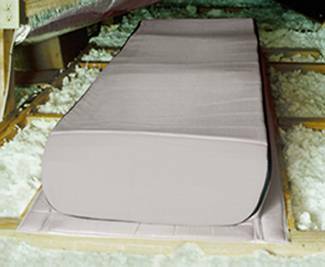 Attic stairs with ladder side rails made from a (1x5 or 1x6) will require additional clearance, the 13 inch height will be needed. See sizing information on product page. 3. 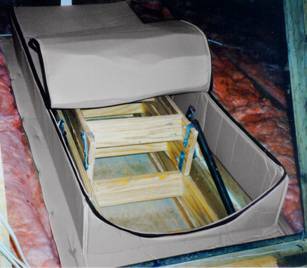 Place Attic Tent with the zipper heads at the hinge end of the attic stair box. 4. Staple the mounting flange to the rough frame, on all four sides about every 2 -3 inches. 5. Seal between mounting flange and rough frame with a bead of caulk. Note: View videos on home page to see active installation!